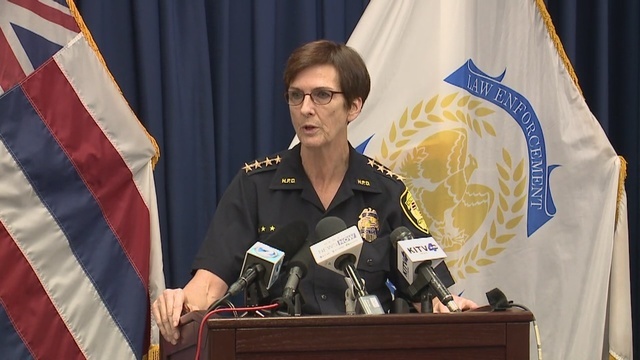 HONOLULU (KHON2) - The Honolulu Police Department held a press conference about Wednesday night's deadly officer involved shooting in Mililani. Officers were in the Wal Mart area on an unrelated case when they heard a call about a male theft suspect. One of the officers saw a male that matched the description in the parking lot and followed his truck onto Lanikuhana Avenue. The officer was then joined by two other officers and their vehicles. When the suspect stopped at the light on Lanikuhana Avenue and Anania Drive they surrounded the theft suspect's truck, identified themselves and ordered the driver to exit the vehicle. The suspect ignored the commands and rammed the police vehicle behind him in an attempt to flee. The suspect then accelerated toward one of the officers, at which time, a second officer fired at the truck to stop it. The officer that was in the line of the truck also fired at the truck. The vehicle continued on Lanikuhana Avenue where it slammed into a tree. When the officers arrived at the truck they discovered that the male driver had been fatally shot. Two passengers, one male and one female, are in critical but stable condition with crash-related injuries.